The PSX-15 and PS-15 Rotary potentiometers features configurable capabilities for complete design flexibility in a small 15mm package. The sensor offers a new surface mountable solution for detecting changes in angle and position and converting them into a highly reliable voltage output. The sensor can be processed by standard automated placement equipment and reflow (or lead-free reflow) soldered. For applications where the angle is critical, locating pins are available. The PS-15 & PSX-15 Series is available with different rotor designs and 15 shaft styles. This offering allows PIHER to configure a custom sensing solution for virtually any control or position feedback requirement. The result is a customized sensor that maximizes board density, reduces weight and eases assembly while achieving the engineer’s critical sensor design goals for the application. A wide range of options, including up to 38 detents (stop positions), allows further customization. Detents not only add a crisp "click" sensation for each position without affecting the original sensor specification or performance, but also offer significant savings in both cost and space; and are particularly advantageous in industrial and domestic power tool applications to prevent accidental movement. 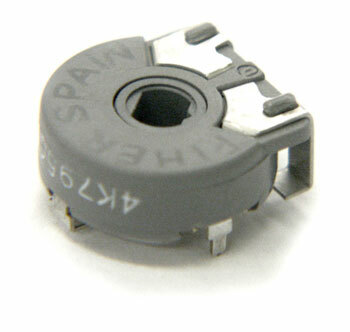 All our potentiometers are available with or without detents. The PS15 Rotary Position Sensor offers application for both feedback and control where frequent adjustment or feedback is required. The shaftless design allows for employment of different engagement mechanisms, such as a customized shaft, a motor control, a human interface adjustment, or a mechanical arm position locator. The sensor can also control variable outputs including frequency, change in motor speed or volume. Typical applications include test and measurement equipment, consumer electronics, appliances, small engines, robotics, motion controllers, and medical equipment control panels. PIHER offers complete design-in engineering services that can supply variations of the PS-15 / PSX-15 to meet customer specifications. For a smaller 10mm version please see the PSX-10 rotary sensor and the PSX-6. • Specifically designed for leadfree relfow soldering processes. + Wiper positioned at initial, 50% or fully clockwise. + Self extinguishable plastic UL 94V-0 and moisture sensitivity level 1 (PS-15 only).